Mass Energy "Can We Dance?" Single and Video out June 30! 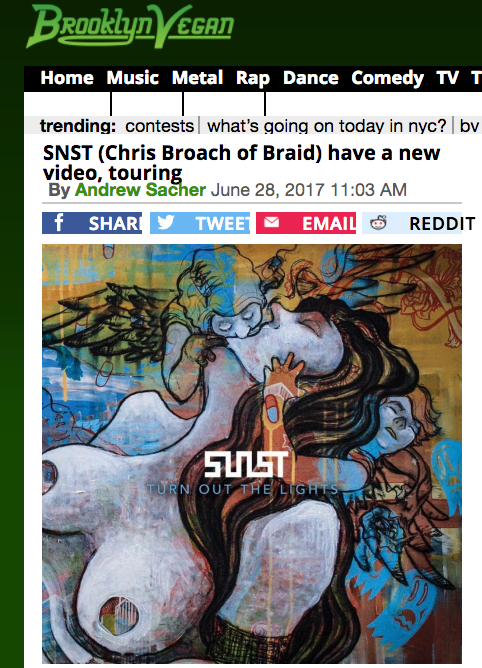 Brooklyn Vegan video Premiere for SNST, pre-orders launched, and tour dates announced. Braid co-frontman and The Firebird Band frontman Chris Broach released Turn Out The Lights, the Will Yip-produced debut album by his new band SNST (pronounced “Sunset”), earlier this year (order yours). Like The Firebird Band, Turn Out the Lights ditches Braid’s punky edge for synthier rock, and Chris’s singing is clearer and more melodic than the shoutier stuff he did in Braid’s early days... It’s a different vibe, but it’s really great stuff in its own right. If you haven’t heard the album yet, you should stream it below. 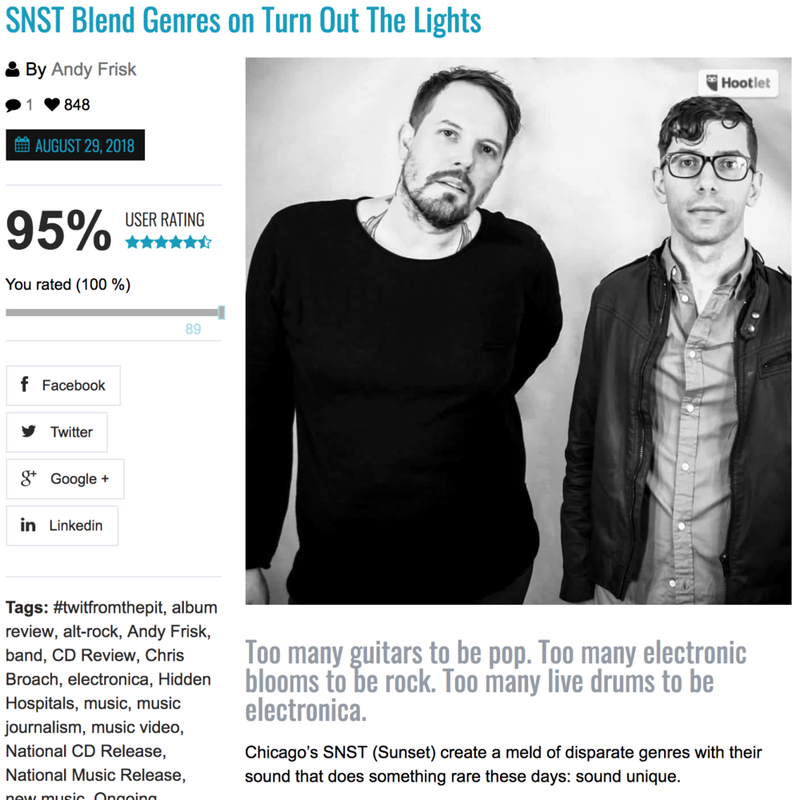 SNST’s debut full length album, Turn Out The Lights(produced by Will Yip and recorded at Studio 4,) is the smart kind of genre bending album of music that exists somewhere on the periphery of the type of electronica influenced rock/electronica that we’ve come to expect from artists like Moby. While SNST aren’t as steeped in the club-like sounds that define most of Moby’s music, they definitely make use of the best parts of the worlds of electronica and rock music to come up with something that sounds uniquely disparate, yet consistent. In other words, they are that rare interesting listen that most audiophiles will love getting lost in… the type of album that keeps you interested, not just because of the smart melding of genres, but because of Broach’s voice, lyrics, and the duo’s smart songwriting… With [Chicago’s] diverse genre history comprised of everything from WaxTrax! industrialism to Buddy Guy blues to Smashing Pumpkins grunge/metal, bands like SNST embody the next logical musical step.